I’ve never been real crazy about “Mother’s Day”—I think it’s a largely commercial, manufactured event that too easily romanticizes motherhood. I’d just as soon let it slip through unnoticed. This one had some really sucky parts to it. Pardon the French but that’s just the truth. I woke up a little earlier than usual for a Sunday morning and reached for my iPhone/alarm clock to check the time. I saw it was 3:54 and that I had an unexpected and particularly painful text message. No point trying to stay in bed after that. My cup of coffee tasted good and I remembered my mom who was always up much earlier than the rest of us, drinking her coffee. I’m not her but I am her daughter. I was aware of my mom’s absence all day and a couple of times during the morning services, I felt the grief start taking over and managed to save it for another day. But I was cranky—I was cranky with members of my congregation who’d poured themselves out to have a lovely celebration, I was cranky with my spouse. I was really cranky with my daughter on the day we were celebrating her 16th Birthday (the actual date is Wednesday but we had friends over for cake and “fixings” yesterday evening). It was when she was blowing out the candles on the cake and I realized that she’s crossing the threshold I’ve been dreading (after Wednesday she is eligible to move into BARC housing and there are now only two weeks to go), that the hard rock of anger, disappointment and fear dissolved into the enormity of the horizon I see ahead at every turn. I have to help a group of truly wonderful people find a way as a congregation through more loss, more confusion about who we are and how we serve as a community of faith. I have to trust that the decisions we’ve made about our girl are life-giving for her and Sherod and me. Yesterday, I saw quite starkly that I need to find some new ways to deal with anger. Not fun work, to put it mildly. And hard as all that was, there were also gifts. Lovely gifts. LM made a breath-taking Koosie for me. It’s so pretty it hurts. She made one of those signs you hang from the door knob. One side says, “Don’t Disturb Mom”. The other side has a wobbly heart and “Come in please. I need a hug”. She and Sherod gave me a pendant—of a small heart contained within a larger one. Her heart in mine. Mine in hers. We in God’s heart. Any way I think of it, I find comfort. My spouseman gave me another huge gift. We just finished getting our dock rebuilt. Over the weekend, he bought a big piece of Styrofoam, fitted it out with two-by-fours and set it up as a floating extension to our new dock. It might not sound like a very romantic gift but it. is. AWESOME. I now have a way of to use the paddleboard I got for Christmas whenever I want. So this morning, when the New River was still glassy-still, I paddled. In the process, I had to: Negotiate a piece of equipment that’s almost 11 feet long onto a wobbly dock. 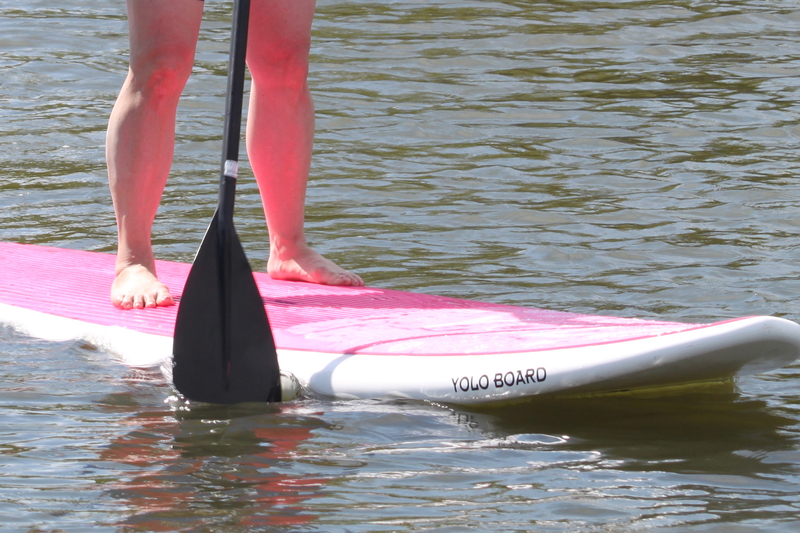 Get my self on the paddleboard making sure I did what I am supposed to do to protect my bionic hip. Deal with something that stays afloat but is totally unsteady under my feet. Be out there with all my uncertainty, all my ignorance, all my inexperience hanging out for all to see. I can’t do my favorite trick of being a duck looking calm while paddling furiously below the surface. At one point, I tried to turn too quickly and lost my balance. I did not want to fall into the New River so I figured out to drop down on my knees and do it quick. At that point, I figured the way forward is taking one baby step at a time. I stayed on my knees to paddle back to the dock. I suspect there’s lots of kneeling ahead for me. I was trembling when I got off—muscles I don’t use much tired out and feeling overwhelmed by the responsibility for steering that small and insignificant vessel. It struck me then. The gift you get on Mother’s day—any day really—is the gift of your own life.